Luton chief Nathan Jones knows full well it will be far from easy to get back to winning ways at Newport County this afternoon. 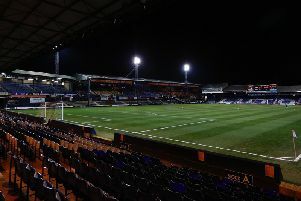 The Hatters go into the game on the back against their opponents who can still make the play-offs, on a four match winless run, which has seen them draw three times. Town haven't tasted victory at the Exiles since Danny Crow scored a last-gasp winner back in 2011, with two draws and three defeats since then, as Jones said: “It’s an extremely tough one, it’s always a tough game when you go to Newport for all sorts of reasons and we have no doubt we’re going to get another stern test on Saturday. “But we’ll be ready for it and games are coming thick and fast which we kind of like. “It was good to get the Accrington result out of the way and kind of bounce back, not go two games on the bounce, as we haven’t lost two on the spin all season and now we build. “We’ve got to finish the month strong and then go into the final furlongs in good spirits." Although the hosts haven’t won at home for four matches and only ended their nine-game run without a victory at Yeovil last weekend, Jones knows his side aren't approaching the match in the best form either. He continued: "We’ll prepare in the way that we want to prepare for it.. We haven’t won in four games either, so something might have to give, but it’s just one of those things. "They’ve had a lot of games, had the FA Cup game (against Spurs), pretty similar to us, so teams at our level and the level above have dips now and again. Last year Jones was hugely critical, and quite rightly so, of the pitch at Rodney Parade which resembled a ploughed field. However, it was relaid in the summer and despite the club sharing with Newport RFC, Jones is hopeful of being greeted with an improved playing surface. He said: “It’s a lot better than it was last year, trust me on that. "They know two teams are going to play on it, so how it’s held up I don’t know, we only see it from the video and there’s grass on it which is a massive improvement from last year, because there wasn’t. Apart from the injured Lawson D'Ath, Town will be at full strength for the clash as Jones confirmed Andrew Shinnie was fit despite missing out from the squad who drew 2-2 at Coventry on Tuesday night. He added: "We're all good, Lawson D’Ath is the only one, we're full strength, so no issues. “I try to tell my players not to read a hell of a lot into benches at times, because what we do, we tend to pick a goalkeeper two defenders, two midfielders and two front men. "So sometimes we’ve put him (Shinnie) and Gambo (Luke Gambin) on the bench. We had a difference between Olly Lee and Gambo, Gambo’s a real good impact player, Shinnie’s been fantastic for us for the majority of the season, away from home we decided to leave him out. "The fact that he misses out from the bench doesn’t diminish his role here or anything, it just means for what we feel we may need that sometimes happens. "I try to reiterate to the players, although they don’t always accept it that way, but picking bench is different from picking a side. "Because you’re picking a side for what you might need over 90 minutes, whereas you’re picking a bench for something you might need over 90 minutes but could only use for 10, so it’s a different mindset."